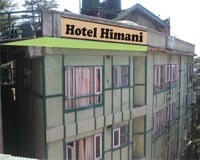 Hotel Himani's Premium's convenient location, exceptional and personalized services has made it a popular choice among the guests. The hotel suits both the business and leisure travelers for its excellent accommodation facilities, business facilities and fine dining. Hotel is an excellent value for money. Location : Shimla Airport : 22 KM, Railway Station : 2 KM, Bus Stand : 1 KM.